By the 1870s railway traffic had grown to the level that four tracks were needed and there was little room on either side of the existing tracks for development without demolishing buildings. Wolverton was by this time no longer an important stop for all trains and express trains needed a clear run through Wolverton. The chairman of the London North Western Railway Company was the energetic and forceful Sir Richard Moon and he determined that the Works would be united and the best solution was to build a loop line which skirted Wolverton to the east. This necessitated building a new embankment, a new canal bridge and a second bridge over the Old Wolverton Road. Plans were drawn up in 1878 and the work was finished in 1882. Old railway hands were dismissive of the project. They felt that the curve and the camber of the line would lead to derailment at high speed and dubbed the project "Moon's Folly". In the event there was no known incident of derailment and the loop line appears to have been well-engineered. 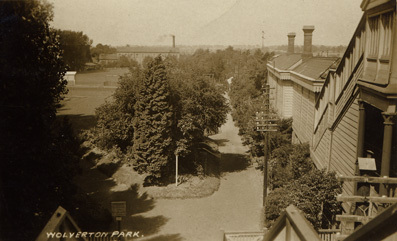 As Wolverton was no longer a compulsory stop for all trains, a large station with refreshment rooms was no longer needed. This third station, built in 1882, was a much more modest affair. 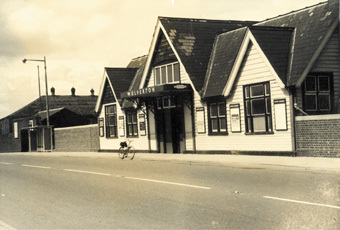 The station was an attractive timber and red brick construction built on brick piers so that the station entrance was at the top of the hill on Stratford Road. Many residents still fondly remember the pleasant ticket office with the well polished woodwork and coal fire. One consequence of the new line was that it left a parcel of land that was landlocked between the Railway Workshops, the Canal and the new line. This gave the LNWR the opportunity to provide the Town with a purpose built Recreation ground on this seven and a half acre site. 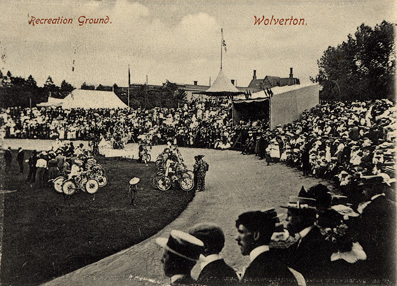 Wolverton Park included a picturesque redbrick and half-timbered groundkeeper's lodge and a bandstand. There was a running track, cycle track, football pitch, bowling lawn and tennis courts included. On the Opening Day of Wolverton Park workers were given a special holiday to celebrate and they were all on full pay. 2,296 children over the age of 5 received one of the special commemorative medals especially struck for this event. The Park’s annual Whitsun Sports became well-known national events with athletics on one day and cycling on the next. The early years of the Football Club were also very successful and the local side were playing teams like Chelsea and Arsenal.